Located within walking distance of the famous Urangan Pier, Pier One Resort offers luxurious apartments for the discerning holiday maker. Our deluxe two and luxury three bedroom apartments are furnished with leather lounges, 100cm LCD TV, and Home theatre system. All apartments have ducted air conditioning and ceiling fans. The kitchen is designed with European stainless steel appliances, granite bench tops, microwave, dishwasher, insinkerator and large Fridge. Each apartment from the ground floor up, has ocean views of the Bay. Higher floors have uninterrupted ocean views of Shelley Beach, the Urangan Pier and Fraser Island. Stroll the Esplanade to enjoy an array of Restaurants and cafes. Whatever you choose to do on your holiday, Pier One Resort is the only place to stay. 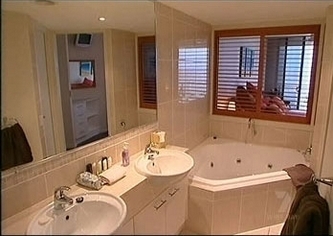 Self contained two bedroom apartment with spa and ocean views. Quality furnishings including large LCD tv, ducted air conditioning, etc. Book your tours with us and save even more! Luxury 2 bedroom with Spa & Ocean Views WINTER MADNESS! 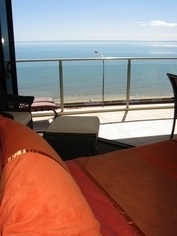 Self contained two bedroom apartment with spa and ocean views. Quality furnishings including leather lounges, large LCD tv, ducted air conditioning, etc. Book your tours with us and save even more! Self contained three bedroom apartment with spa and ocean views. Quality furnishings including leather lounges, large LCD tv, ducted air conditioning, etc. Book your tours with us and save even more! Self contained three bedroom apartment with spa and ocean views conveniently located on the ground floor. Quality furnishings including leather lounges, large LCD tv, ducted air conditioning, Price is INCLUSIVE of a half day whale watching for two adults and two children under 6 years old. Surcharge is applicable for older or extra adults/children. 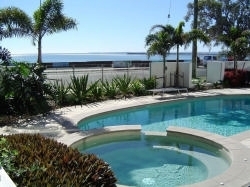 Luxury 3 bedroom with Spa & Ocean Views WINTER MADNESS! Self contained ground floor three bedroom apartment with spa and ocean views. 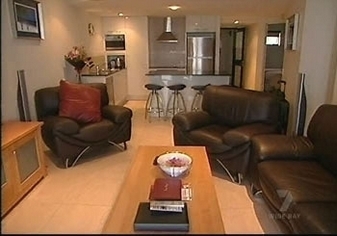 Quality furnishings including leather lounges, large LCD tv, ducted air conditioning, etc. Book your tours with us and save even more! All check in instructions will be provided in a SEPARATE booking confirmation email (not the Roamfree confirmation) sent by PIER ONE RESORT. Hervey Bay and the Fraser Coast are home to an abundance of Wildlife. During July to early November, the magnificient Hump Back Whales are at play in the Bay. Further offshore is the World Heritage Listed Fraser Island. An abundance of sea creatures include dolphins, dugongs and turtles. During your stay, hire a beach bike from Beach Safaris and ride the 18kilometres of bike track that surrounds Hervey Bay. 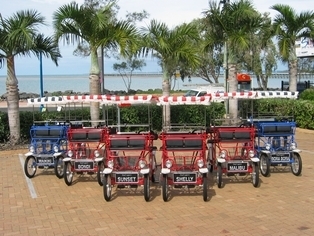 We can organise pushbikes, car hire, scooter hire as well as organise any tours of Fraser Island, Whale Watching or magnificient Lady Elliot Island.